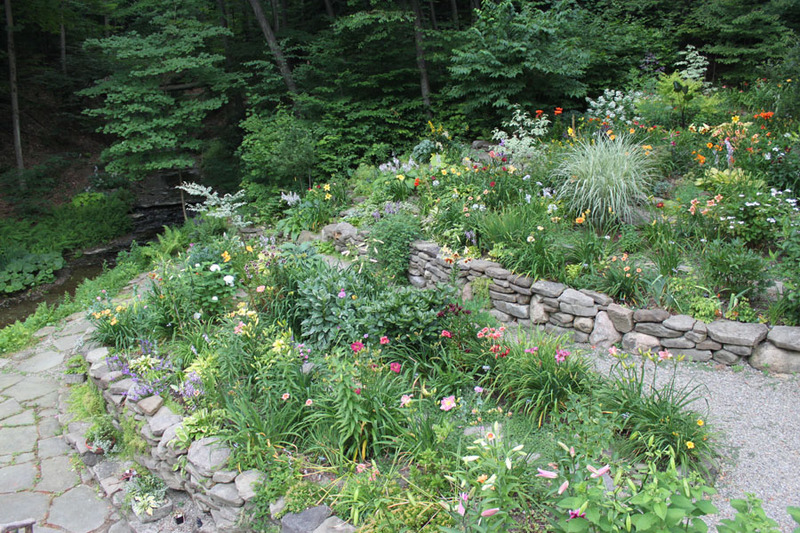 Because of the steep slope of the property near the house, a decision was made to terrace one side of Smug Creek in order to provide flatter areas for planting and to be able to add a better soil than nature had provided. 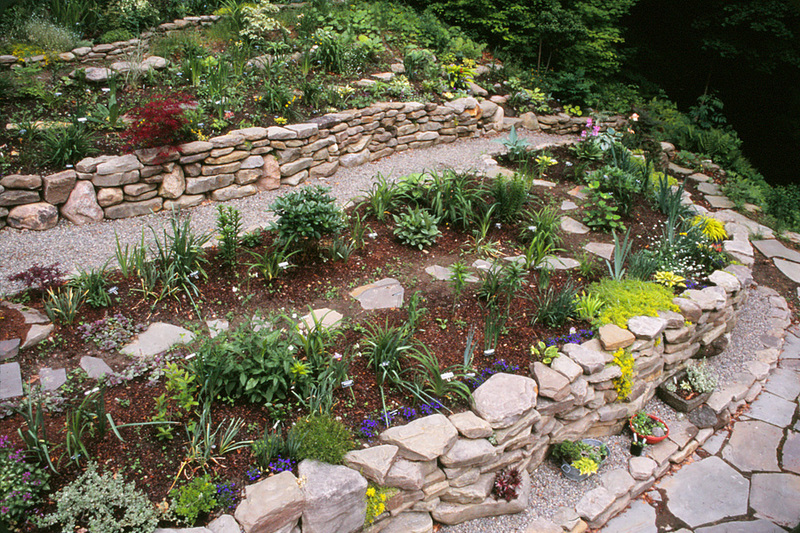 A friend did the rough terrace and Mike built layer after layer of dry-laid stonewalls that define and restrain each level. 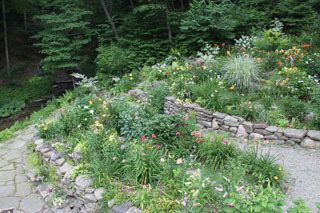 During the first four summers we brought tons and tons of stone to the property and began building the walls. We removed several large trees to allow more light and then, starting with the terrace furthest from the house, we rotatilled the thin top soil and removed the large pieces of shale and slate. 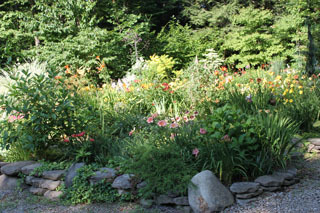 Then we were able to back fill with truckloads of topsoil and compost. The lowest and largest wall was completed in 2009 and gravel paths and steps were installed. 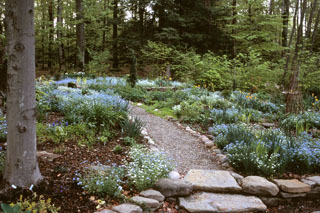 Later that year we created the woodland walk and finally in 2010 added a stone patio that overlooks the creek. 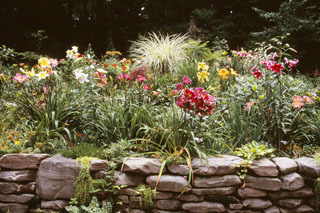 The walls keep the natural look of the property and also offer amazing planting opportunities. At the edges of the walls are small and mini hostas, dwarf conifers, mini daffodils in the spring and many smaller plants like epimediums that are better viewed closely. As the terraces rise up and the steps become shallower and shadier, larger plants are added. 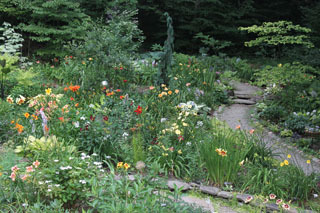 Around the back of the terraces is the partially hidden woodland walk with a small fairy garden. The terraced gardens feature a collection a mature hosta that grow especially well in these conditions, a large selection of modern and historic daylilies, many irises, peonies, hydrangeas and a variety of unusual perennials. 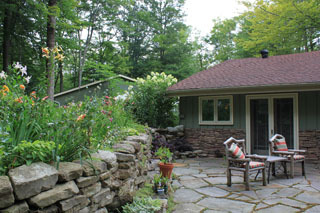 Structure is give to the garden design with conifers, Japanese maples and other ornamental trees. We have done our best to plant a succession of color and interest in this garden and think that it has something to offer from spring until early fall.